Manila, Jan 17 (IANS) Sri Lankan President Maithripala Sirisena signed on Thursday three loan agreements totalling $455 million with the Asian Development Bank (ADB) to fund projects in higher education, transport as well as a technical assistance loan in the urban sector. Sirisena signed the agreements during his first tour to the ADB headquarters while conducting a five-day state visit to the Philippines, Xinhua news agency reported. He arrived in the country on Tuesday. The loans include $145 million for a project to support the development of science and technology faculties in four universities, $300 million to finance construction of about 5.3 km of an elevated toll highway to link Colombo's international port with the country's expressway network and another $10 million technical assistance loan to finance the establishment of a facility to help improve the design and implementation of urban projects in Sri Lanka. This year, the Manila-based bank said the ADB's total commitment to Sri Lanka, including these three loans, will amount to $815 million. "Sri Lanka highly values the assistance provided by the ADB to various development plans of our country," Sirisena said. ADB's Country Partnership Strategy for Sri Lanka focuses on building high quality infrastructure in the transport, energy and urban sectors by expanding investments in areas like railways, wind and solar power generation as well as economic corridors, the report said. Sri Lanka was a founding member of the ADB in 1966. Since a first loan to the country in 1968 to help modernize tea factories, the ADB has supported Sri Lanka's economic transformation with assistance totalling $9.8 billion, including through concessional loans and technical assistance. 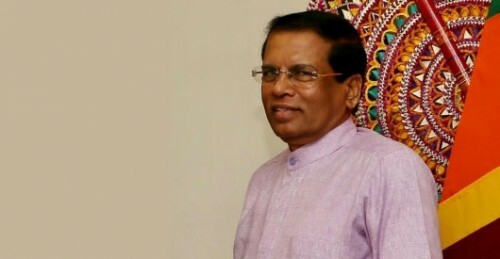 Sirisena had met President Rodrigo Duterte on Wednesday and they discussed issues "on areas of mutual interest, including political, economic, cultural and people-to-people engagement". Aside from visiting ADB, Sirisena will also visit the International Rice Research Institute in Los Banos in Laguna province, south of Manila.